"VIVITE UT VEHATIS. VEHITE UT VIVATIS"
Captain and Officers on horseback. Skeleton Walking Krewe handing out the D'Etat Gazette (Carnival Bulletin) leading the parade. 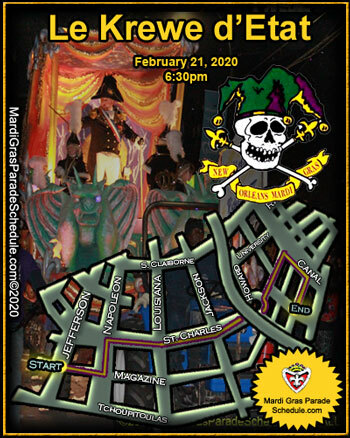 The August members of Le Krewe d'Etat heed only edicts from their Dictator, whose identity is never revealed, and claim the streets of New Orleans annually and present a parade without peer on the Friday before Mardi Gras, or "Vendredi Gras" as it is now known. Le Krewe d'Etat emerged in 1996 as the preeminent krewe and now boasts numerous floats with many riders. It's floats adhere to a traditional style of design that impart Le Krewe d'Etat's satirical theme, which has been voted "Best of Carnival" by critics. Le Krewe d'Etat has opened the door for other krewes showing their most sincere form of flattery by trying in vain to imitate what comes naturally to this unique group of Mardi Gras revelers. Le Krewe d'Etat was also the forerunner in innovative throws, introducing the most prized catch: glow-in-the-dark beads with flashing green eyes! Le Krewe d'Etat is returning to the drafting table to create even more revolutionary designs for next year's parade throws that will be worth more than gold on the French Quarter exchange. The theme for the parade is, as always, a closely guarded secret. The Dictator, however, assures his denizens that no rank or office is immune from his wit. All who preen in public are fair game for this irreverent band of hellions whose battle cry connotes the essence of the organization and, indeed, of Mardi Gras itself: VIVITE UT VEHATIS. VEHITE UT VIVATIS. Throughout history there have been many notable dictators. Heretofore there have been none wielding a femur scepter with such power and control over his dominion as The Dictator. Like most dictators, The Dictator, came to power during a time of crisis. The people were looking for a savior, a knight in shining armor to rescue the kingdom of carnival from death and despair. Mardi Gras had fallen into the hands of hucksters and marketeers aiming to make a buck. More interested in the selling of Mardi Gras than the celebrating of Mardi Gras. Things had been forgotten that shouldn’t, things faded from memories of days long ago and could no longer be remembered. The light that illuminated carnival for over a century had grown dim. The public ached for change and had none. The situation was dire, indeed. In a classic coup d‘etat, The Dictator and his legion of irreverent revelers seized control of Mardi Gras and forever changed it. Pulling carnival from the doldrums and out of the greedy hands of the low minded, The Dictator set the stage for Le Krewe d’Etat to ascend to its rightful place in Mardi Gras lore.